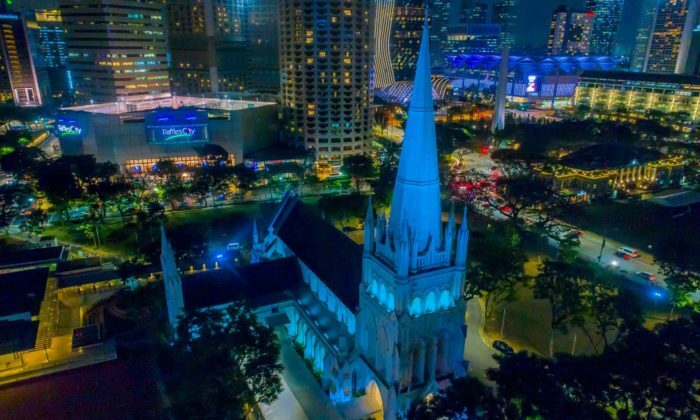 PUB has managed to rally over 30 of its community partners to light up their buildings in blue on 22 March in support of World Water Day, said the national water agency for Singapore in a Facebook post. The minister for the environment and water resources Masagos Zulkifli said that this is more than double the number last year at PUB’s GoBlue4SG Night Carnival at the Marina Barrage on the same day. Partners who have joined the move to demonstrate their commitment to water conservation included the Gardens by the Bay, Marina Bay Sands, Singapore Flyer, and the Permanent Mission of Singapore to the United Nations in New York. PUB started the GoBlue4SG movement this year to rally the public and businesses to support and champion the water cause, as well as to build a strong water-conscious culture in Singapore. According to Zulkifli, retailers had offered “blue deals” in support of the movement. PUB’s community partners had also taken the lead to organise initiatives to engage employees, customers, and members of the public on the importance of water conservation in Singapore. Beyond the shores of Singapore, Bacardi and Lonely Whale has launched a #TheFutureDoesntSuck global campaign on World Water Day that encourages consumers to remove one billion single-use plastic straws by 2020. On a new landing page for the public to take a pledge, the company featured a “Cease and De-Sip” letter issued to Unicode Consortium to request the removal plastic straws from its emojis. An one-minute video by a comedian regarding the move has garnered over 700 views within the past few days. Instagram users can shop and purchase directly on the app starting next week with select brands. A larger roll-out is expected soo..
Takahito Irie, former digital creative with Dmajor/GroupIDD, is appointed as the artistic creative director at Good People Basical..
Fluid has revamped its ILoveSoHo.hk portal to create a social network outside the SoHo community in Central, investing HK$1 millio..
To respond to the changing market, it’s time for agencies to evolve by investing more in technical talents, from business strategi..